The Wireless Pan/Tilt Internet Camera Server (TV-IP410W) provides real-time wireless security surveillance over a large viewing area. Monitor people in your camera’s viewing field and manage the camera from any Internet connection. See more with one wireless Internet camera-remotely pan the camera side-to-side a remarkable 330 degrees and tilt up-and-down 105 degrees. The TV-IP410W provides high quality video streams over a secure wireless connection. Advanced intuitive software includes motion detection recording, email alerts (Does not support SSL, Windows 32-bit only. Monitoring multiple cameras may require a high performance CPU and graphic card) and scheduled recordings. This camera’s brilliant image quality, pan and tilt functionality and low light recording capabilities make it ideal for home, small office and business use. SecurView cameras are not compatible with TRENDnet’s IPView Pro camera application for ProView cameras. D-Link is pleased to introduce the newest product in Internet camera technology. Remotely watch and listen with the D-Link SecuriCam DCS-5300 Internet Camera. The DCS-5300 Internet Camera is a full-featured surveillance system that connects to an Ethernet or Fast Ethernet connection to provide high-quality video and audio over the Intranet or the Internet.The DCS-5300 Internet Camera differs from a conventional PC Camera because the DCS-5300 is a stand-alone device with a built-in CPU and Web server that allows you to access your camera using Internet Explorer 5.X or above from anywhere in the world. The Pan/Tilt Internet Camera Server (TV-IP410) provides real-time security surveillance over a large viewing area. Monitor people in your camera’s viewing field and manage the camera from any Internet connection. See more with one Internet camera-remotely pan the camera side-to-side a remarkable 330 degrees and tilt up-and-down 105 degrees. The TV-IP410 provides high quality video streams over a secure connection. Advanced intuitive software includes motion detection recording, email alerts (Does not support SSL, Windows 32-bit only. Monitoring multiple cameras may require a high performance CPU and graphic card) and scheduled recordings. This camera’s brilliant image quality, pan and tilt functionality and low light recording capabilities make it ideal for home, small office and business use. 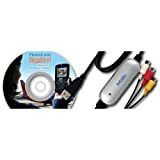 SecurView cameras are not compatible with TRENDnet’s IPView Pro camera application for ProView cameras. The Wireless Internet Camera Server (TV-IP110W) transmits real-time high quality video over the Internet. View your camera from any Internet connection. Complimentary SecurView camera management software provides advanced monitoring of up to 16 cameras to protect what you value most. This stylish and compact Internet camera provides crystal clear MJPEG video streams. Mount the wireless camera on most surfaces with an included mounting kit. 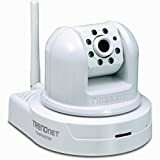 Intuitive software features motion detection recording, email alerts (Does not support SSL, 32-bit only, monitoring multiple cameras will require a high performance CPU and graphics card), and scheduled recordings. The camera’s brilliant image quality, intuitive setup and complimentary software make it ideal for your home or office. SecurView cameras are not compatible with TRENDnet’s IPView Pro camera application for ProView cameras. The Wireless Day/Night Pan/Tilt Internet Camera Server with Audio (TV-IP422W) provides day and night security over a large area. See, hear and talk to people in your camera’s viewing field day or night from any Internet connection. Secure a larger area with wireless pan and tilt Internet cameras-. Pan the camera side-to-side a remarkable 330° and tilt up-and-down 105°. The TV-IP422W provides high quality video streams over a secure wireless connection. Advanced intuitive software includes motion detection recording, email alerts ( Does not support SSL, USB port supports up to 500mA power device with FAT16/32 format, the 3G service from a mobile phone provider is required, Windows 32-bit only. Monitoring multiple cameras may require a high performance CPU and graphic card.) and scheduled recordings. This camera’s brilliant image quality, pan/tilt functionality, day/night recording capabilities and built-in 2-way audio make it ideal for home, small office and business use. Note: Does not work with TV-H400 dome camera enclosure. 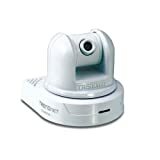 SecurView cameras are not compatible with TRENDnet’s IPView Pro camera application for ProView cameras.